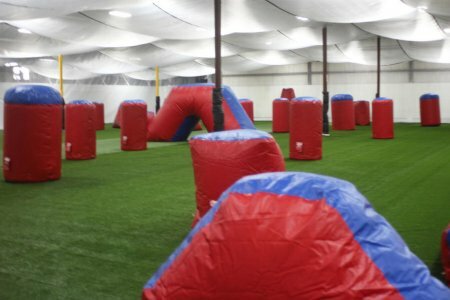 Midwest Paintball Opens Premier Indoor Paintball Field! Home » Featured » Midwest Paintball Opens Premier Indoor Paintball Field! MORRIS – Five years ago, Ray Smith’s son, Shane, started playing paintball. With a business background and an eagerness to move away from truck driving, Smith said he looked into paintball as a business opportunity. For the last two-and-a-half years it’s been a long haul, he said, but Midwest Paintball is finally nearing its debut in Morris. The past week, finishing touches were underway on the indoor facility, a former warehouse at 3727 N. Division St. The course is laid out the same way as one in the National Xball League World Cup. 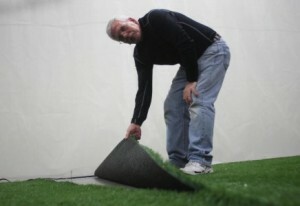 Smith said competitors enjoy playing on indoor courses that mirror the course used in the sport’s biggest event – held in Florida every year – because it allows them to be as prepared as possible. 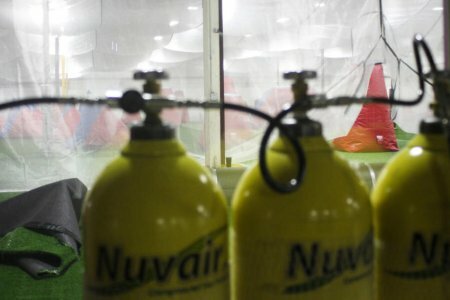 Soon, players from Grundy County and potentially all over the Midwest will duck under and behind 50 inflatable bunkers set up on the course, as they try to dodge paintballs flying through the air at 100 mph. Groups can reserve time at the course, which actually resembles a smiley face from an aerial view, Smith said. Smith made sure to do his homework on every aspect of the business, from the artificial turf floor that was being pieced together Thursday, to a tournament-strength compressor system capable of supplying air to nearly 2,000 players. “We want to do it the right way,” he said. He even looked into the science of picking a name. A marketing specialist told him the original name he thought of would never allow the business to reach its full potential. Smith realized how a regional name could attract many people. The name Midwest Paintball has a broader appeal, he said. “We can have people from five different states driving here in four hours or less,” he said. Although he hopes to get visits from the Illinois State Redbirds Paintball Team and a professional team called the Houston Heat, Smith was able to acquire an experienced and knowledgeable staff member from nearby. Stefi Barnes, who has managed Chicago Damage Inc. and 665 Almost Evil competitive teams with her husband – who is known in the industry as “Q Ball” – will be running the retail desk. She’s not your average front desk person. Since beginning in 2006 as a supportive mom to her three paintball-playing kids, who are now ages 24, 22 and 18, Barnes said paintball is the family’s lifestyle. For weekend practices, they had to drive at least an hour to indoor facilities amid winter cold or summer heat – until now. They travel with their teams across the nation to compete. Midwest Paintball Indoor Field with Alpha Professional Paintball Netting, Premium Paintball Turf, and PSP Bunker Kit. Barnes and her husband have enough gear at their house along Ashley Road to outfit a five-person team. “I’ll go to [Grundy County] Corn Fest and Morris Cruise Nights and see faces of people I’ve seen on a paintball field,” Barnes said. Within days, many of those familiar faces and plenty of new ones could be coming into Midwest Paintball. Smith said the opening date and time will soon be announced on Midwest Paintball’s Facebook page and MidwestPaintballInc.com. Alpha Sports Inc. was proud to work along side Ray and his son in supplying Alpha Premium PSP Paintball Turf, Alpha Professional Paintball Netting, PSP Bunker Kit, Premier Paintball Compressor System, and all other needed Paintball Field Supplies. Thanks again to Ray and his Son! One Response to Midwest Paintball Opens Premier Indoor Paintball Field!